Welcome to Medlin Mazda your new and used car dealership that you can rely on in the Wilson, NC area. Proudly serving to the surrounding areas of Rocky Mount, Nashville and Raleigh, we are sure to have a vehicle that will make your drive worthwhile. 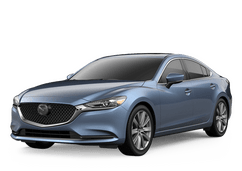 Take a look at our new Mazda’s and used car inventory, make note of what catches your eye, then call in and schedule a test drive. We want to make sure we fix you up with a new set of wheels like the Mazda CX-5, CX-9, Mazda3 or the Mazda6. What's not to love about these sleek and sporty models? Talk with our Finance Department to discuss auto finance and leasing options available to you. Our team wants to make sure you are driving off in the car you came here for. Once you have your vehicle financed, contact our Service Department to schedule a maintenance appointment. The Mazda certified technicians at our dealership will make sure your vehicle is running in pristine condition! If you have any further questions call (866) 625-1834, fill out our contact form or come visit us using our custom turn-by-turn directions. We look forward to working with you! Last winter, I had serious transmission woes with a 2010 Mazda 3 while en route from New England to Florida. My usual dealer had twice botched the repair. In desperation, I called Medlin simply because it was close to I-95. They invited me to bring the car in at once. In less than two hours their mechanic found the unusual problem, fixed it and I was on my way south ... . Fine, fast work, fair prices, and really nice, trustworthy people who treated a transient snowbird like a valued local customer. Oh my Karen, Oh my Karen, Oh my car salesperson Karen! Thanks for making our car buying experience yesterday very enjoyable. Thanks for your patience with all my husband's financial questions, thanks for explaining all the technology in my new car to me, and helping me get everything set-up perfectly! I love my new Mazda 3 and highly recommend driving to Wilson for ... your next new car. We will definitely go back there for our next new car!